4Videosoft Creative Zen Converter Suite for Mac is the best Mac Creative Zen Converter which has two parts: DVD to Creative Zen Converter for Mac and Creative Zen Video Converter for Mac. 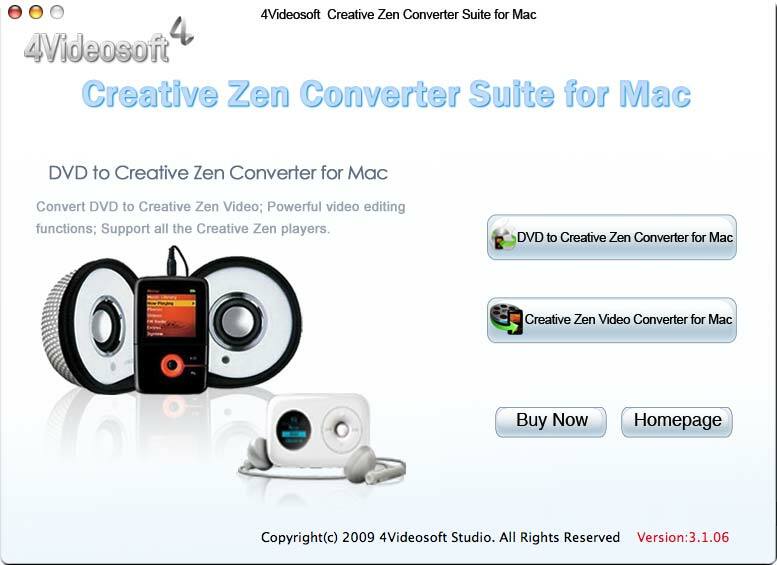 The major functions of 4Videosoft Creative Zen Converter Suite for Mac includes: convert DVD video to Creative Zen Mac AVI, MP4, MPG, MP3, M4A, WAV, WMA files, converting popular formats to Creative Zen video/audio formats such as MP4, H.264/MPEG-4 AVC, etc. Transfer any DVD to AVI, MP4, MPG, MP3, M4A, WAV, WMA files supported by Creative Zen players. Powerful conversion tool which can convert video, audio, even HD video to Creative Zen video/audio formats. 4Videosoft Creative Zen Converter Suite for Mac gives users the access to design video effect from brightness, contrast, saturation, volume, audio track, subtitle etc. More professional settings could be found in Settings window where users can edit Encoder, Frame Rate, Resolution, Bitrate. Press Save as.. to keep all parameters for next use. Move slippers or fill concrete times to select any length of the video to convert and press Crop to expand or reduce the aspect ratio. Qweas is providing links to 4Videosoft Creative Zen Suite for Mac 3.2.06 as a courtesy, and makes no representations regarding 4Videosoft Creative Zen Suite for Mac or any other applications or any information related thereto. Any questions, complaints or claims regarding this application 4Videosoft Creative Zen Suite for Mac 3.2.06 must be directed to the appropriate software vendor. You may click the publisher link of 4Videosoft Creative Zen Suite for Mac on the top of this page to get more details about the vendor.